This list provides an overview of books about dancing and the ballet, including ballet traing and techniques. 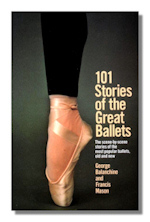 101 Stories of the Great Ballets. George Balanchine, Francis Mason. Anchor (formerly Doubleday). 1975. ISBN 0385033982 (paperback). Balanchine, one of ballet's most respected experts, includes scene-by-scene retellings of the most popular classic and contemporary ballets, as performed by the world's leading dance companies. Written for both long-time fans as well as those just discovering ballet. Ages 9-12. Color photos and illustrations accompany these Retellings of the plots of five of the best-known classical ballets including color photos and illustrations. Also includes notes about mime gestures, and other dance details. Stories from the Classical Ballet. Belinda Hollyer, et al. Viking Childrens Books. 1995. ISBN 0670866059 (hardcover). Retells the stories of eight ballets, including Coppélia, Giselle, The Firebird, The Nutcracker, Swan Lake, La Bayadère, The Sleeping Beauty and Pétrouchka with performance notes on each by former ballerina Irina Baranova. With music on CD from the Nutcracker, Swan Lake, and the Sleeping Beauty. 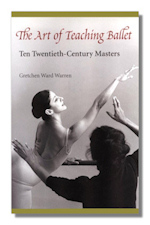 The Art of Teaching Ballet: Ten Twentieth-Century Masters. Gretchen Ward Warren. University Press of Florida. 1996. ISBN 081301459X (hardcover). From Christiane Vaussard in Paris, to David Howard in New York City and Larisa Sklyanskaya in San Francisco, Gretchen Warren profiles ten world-renowned master ballet teachers to capture their philosophies, training methods, and the classroom presence that makes their instruction magical. Based on extensive interviews and classroom observation, each profile is an entertaining and enlightening mix of personal anecdotes and details about teaching techniques, class content and organization. Warren also includes a section of signature exercises drawn from each teacher. Because of the master teachers' diversity of styles and methods, as well as their occasional disputes with traditional wisdom, the book offers a brisk stimulant for reflecting on the values of developing and holding true to one's own style and beliefs. Warren combines her years of experience as a dancer and master ballet teacher and her engaging writing style to create a living history of 20th-century classical ballet training. Like their legions of students, readers will appreciate not only these teachers' philosophies, their endless curiosity, and their devotion to ballet, but also what distinguishes them. Ballet 101: A Complete Guide to Learning and Loving the Ballet. Robert Greskovic. Hyperion. 1998. ISBN 0786881550 (paperback). An introduction to ballet for adults by noted New York ballet critic Robert Greskovic. Ballet for Beginners. Marie-Laure Medova. Sterling Publishing. 1997. ISBN 0806938765 (hardcover), 0806938773 (paperback). An introduction to ballet for children. Translated from the original French. 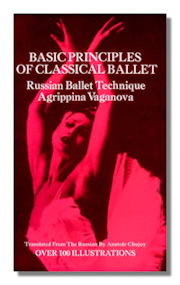 Technical Manual and Dictionary of Classical Ballet. Gail Grant. Dover Publications, Inc. 1982. ISBN 0486218430 (paperback). 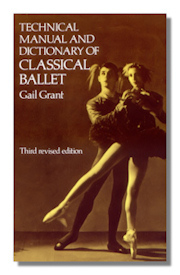 Includes full definitions of ballet terms and steps with illustrations. A Dictionary of Ballet Terms. Leo Kersley. Da Capo Press. 1979. ISBN 0306800942 (paperback). The Language of Ballet: A Dictionary. Thalia Mara, Tina MacKler (Illustrator). Princeton Books. 1988. ISBN 0871270374 (paperback). Ear Training for the Body: A Dancer's Guide to Music. Katherine Teck. Princeton University Press. 1994. ISBN 0871271923 (paperback). 100 Lessons in Classical Ballet. Oleg Briansky, et al. Limelight Editions. 1987. ISBN 0879100680 (paperback). The complete eight-year curriculum of Leningrad's famed Vaganova Choreographic School, which trained Nureyev, Baryshnikov, and Markarova. Includes over 100 photographs. 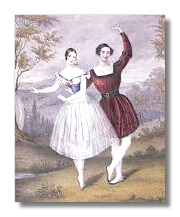 Basic Principles of Classical Ballet: Russian Ballet Technique. Agrippina Vaganova. Dover Publications. 1975. ISBN 0486220362 (paperback). Discusses all basic principles of ballet, grouping movement by fundamental types. Diagrams show clearly the exact foot, leg, arm and body positions for the proper execution of many steps and movements. Classical Ballet Technique. Gretchen Ward Warren. University of Southern Florida Press. 1989. ISBN 0813008956 (hardcover), 0813009456 (paperback). This reference work for students and instructors includes photographs of professionals executing each step with clarification regarding the numerous ballet basics and including discussion of differences in steps from the various schools of ballet. Inside Ballet Technique: Separating Anatomical Fact from Fiction in the Ballet Class. Valerie Grieg, Naomi Rosenblatt (Illustrator). Dance Horizons. 1994. ISBN 0871271915 (paperback). For student, parents, and teachers this book introduces the reader to the natural anatomical laws governing human movement and body mechanics, and relates them directly to the dancer's acquisition of technique in the daily ballet class, and provides a fresh perspective on the basic tenets of classical ballet, answering many questions that commonly persist in the minds of career-track students and dancers. Technical Manual and Dictionary of Classical Ballet. Gail Grant. Dover Publications. 1982. ISBN 0486218430 (paperback). Over 800 steps, movements, poses, and concepts are fully defined. Invaluable aids include a pronunciation guide and cross-references to alternate names for similar steps and positions that vary from the Russian to the French or Italian schools. 175 pp. The New York City Ballet Workout: Fifty Stretches and Exercises Anyone Can Do for a Strong, Graceful, and Sculpted Body. Peter Martins. William Morrow & Company. ISBN 0688152023 (paperback), 0688148433 (hardcover). Over fifty specific exercises, including stretching techniques and training tips, to build strength and avoid injury. Following Balanchine. Robert Garis. Yale University Press. 1995. ISBN 0300061781 (hardcover), 0300070594 (paperback). 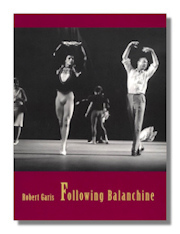 Addresses Balanchine's productions, their history and development, and includes a critical account of the development of the author's own discovery of Balanchine's artistry. Behind the Scenes at the Ballet: Rehearsing and Performing the Sleeping Beauty. Leslie E. Spatt (Photographer). Puffin Books. 1997. ISBN 0670861626 (hardcover), 0140559051 (paperback). Written for primarily for children, this fully illustrated backstage tour of Birmingham Royal Ballet's production of Tchaikovsky's The Sleeping Beauty includes a retelling of the story with introduction of principal characters. Also included are descriptions of dancers taking classes, attending rehearsals, warming up, making up, and dressing for a performance. The Joffrey Ballet: Robert Joffrey and the Making of an American Dance Company. Sasha Anawalt. C. Scribner's. 1996. ISBN 0684197243 (hardcover). The story of the popularization of the ballet made possible by the efforts of Robert Joffrey, and how his approach impacted the development of American dance. The Art of Ballets Russes. Alexander Schouvaloff. Yale University Press. 1998. ISBN 0300074840 (hardcover). The Serge Lifar Collection of Theater Designs, Costumes, and Paintings at the Wadsworth Atheneum, Hartford, Connecticut. Both Sides of the Mirror: The Science and Art of Ballet. Anna Paskevska. Princeton Books. 1992. ISBN 087127180X (paperback). A technical and artistic discussion of ballet, focusing on its history, physical requirements, exercises, and training. A Handbook for the Ballet Accompanist. Gerald R., Lishka. Indiana University Press. 1979. ISBN 0253327040 (paperback). 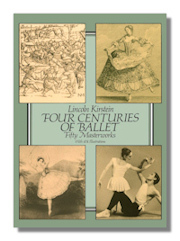 Four Centuries of Ballet: Fifty Masterworks. Lincoln Kirstein. Dover Publications. 1984. ISBN 0486246310 (paperback). In this profusely illustrated study (474 illustrations) Lincoln Kirstein illuminates four centuries of ballet history beginning with French court spectacles of the 16th century. Kirstein examines fifty major ballets: Giselle, Coppélia, Le Sacre de Printemps, Le Lac des Cynges and many more, from five perspectives: priority, precedent, politics, plot and production. 304 pp. Orchesography. Thoinot Arbeau, with Sutton, Julia (notes), Backer, M. and Sutton, J (new lab notation section). Dover Publications. 1995. ISBN 0486217450 (paperback). Valuable book on 16th century dances and dance music. Describes the galliards, pavans, branles, gavottes, lavolta, basse dance, morris dance, canary, etc, with detailed instructions of steps involved. Throughout the text are references to the practices of 16th century barring and notation. Ballet & Modern Dance: A Concise History. Jack Anderson. Princeton Book. 1992. ISBN 0871271729 (paperback). History of Western theatrical dance since the Renaissance. From Petipa to Balanchine: Classical Revival and the Modernization of Ballet. Tim Scholl. Routledge. 1994. ISBN 0415092221 (hardcover). In this interdisciplinary study, Tim Scholl provides a provocative and timely re-evaluation of the development of ballet from the 1880s to the middle of the twentieth century. In his thoughtful re-appraisal of dance classicism, Scholl locates the roots of modern ballet in the works of Marius Petipa, rather than in the much-celebrated choreographic experiments of Diaghilev's Ballet Russe. The first book to present 19th- and 20th-century ballet as a continuous tradition, From Petipa to Balanchine places works such as Swan Lake, Sleeping Beauty, Les Sylphides, Apollo and Jewels in their proper cultural and artistic context. A Century of Russian Ballet: Documents and Eyewitness Accounts, 1810-1910. Roland John Wiley. Oxford University Press. 1991. ISBN 0193164167 (hardcover). This collection of original documents, many appearing in English for the first time, presents a compelling picture of a century of Russian ballet. The documents, which include the printed libretti of Didelot, Taglioni, Perrot, St-Leon, Petipa, and Fokine, convey an accurate outline of balletic conventions in nineteenth-century Russia, and describe techniques of stagecraft, the social setting of ballet, the rise of criticism, and the life of ballet artists. The work of nineteenth-century Russia's principal ballet historians is also represented and the author's commentaries elucidate the documents' relevance and historical connections. 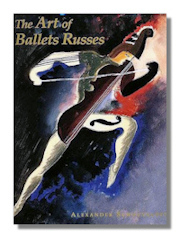 The book will be an invaluable source for anyone interested in ballet or Russian culture. Dancing Through History. Joan Cass. Prentice-Hall. 1993. ISBN 0132043890 (paperback). Setting dance within a cultural context that is both understandable and interesting, this insightful reference captures the true art form of dance and traces the activity of dance as it existed down through the ages and all over the world. Beginning with the origins of dance and moving on to what takes place on Western dance stages today, this volume offers a sweeping overview of primitive, ethnic, and folk dance forms … examines the major branches of Western dance art including ballet from its inception in 16th-century Europe, modern dance, jazz, avant-garde, and the international eclectic contemporary scene … tracks the repertory, technical training of performers, and creative theory of the many traditions that unify this art form … includes discussions of significant dancers, their contributions, and the performers that inspired them; the background of period styles; pertinent ideas of major choreographers; capsule biographies of outstanding dance artists; effects of music and design on choreography; national characteristics of dance; the psychology of performers; and coverage on such concepts as Classic, Romantic, and Avant-garde to clarify trends and invoke thought on the Dance Art and society … and makes many comparisons to current day events. Suitable for anyone involved or interested in dance history.